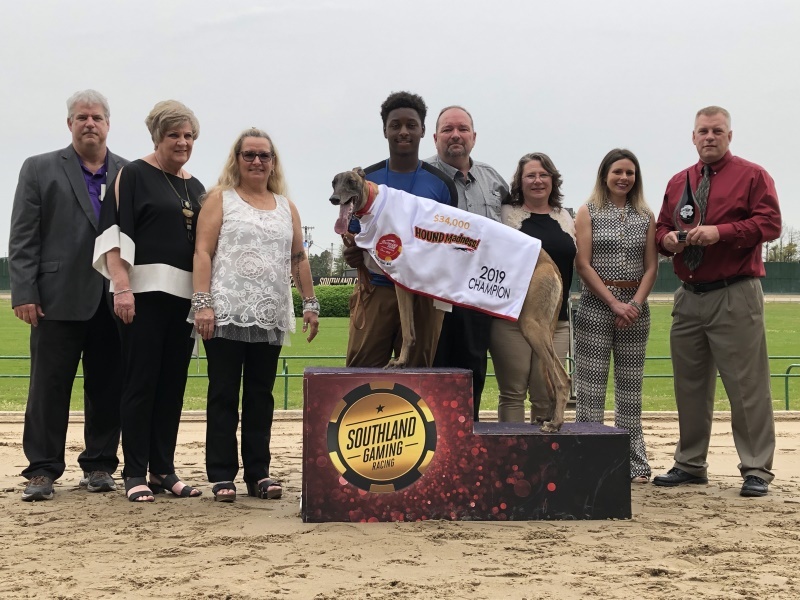 Just like every year at this time, just two greyhounds remained in the “Hound Madness” Stakes at Southland Casino Racing. And just like every year, a head’s up match race would determine the championship. Unlike all the year’s prior though, it likely wasn’t the two anyone was expecting. Many fans were expecting maybe SALUD RAINDROP, who was asserting herself as the latest hot hound to race at the West Memphis oval. As the #1 overall seed, it seemed like a foregone conclusion she was going to reach at least the Furry Four round with little friction. She got bounced in the second round. While not the “normal” for #1 seeds to leave the tournament so quickly, there were still three other top talents in the field like TMC’S ZOOMBA, AMF TRIXRFORKIDZ and CTW DIABLOS WAR. Certainly all three of these, or at least two for sure could make it farther than that. Nope. Nope. And nope. All of them bounced in the opening round. As crazy as that was, it got even more crazy. There wasn’t a top four seed anywhere to be found by the time the Furry Four round came. By the time the championship came around, the lowest remaining seed to make it through was the #5 seed from the South Region. And that #5 seed was Magic City Kennel’s finalist, CHEROKEE FIDDLE. He was considered a veteran in terms of the number of starts he has had at Southland (64 in the past two seasons), but the 3 year old red male started finding his stride quickly during the tournament, racking up four straight victories after surviving a fourth place finish in the opening round to land a spot in the big match race. He had some middle distance racing experience and pedigree as well, which served him very well as the tournament field started whittling down and eight dog races became four dog races. And four dog races became head’s up races. The only question was exactly how good would he be? He dispatched FLY L SINNER (#15 seed) in the first round, but it wasn’t a cake walk. Due to the total “madness” happening in the bracket, his next battle was against a #13 seed (SLATEX STAGHORN) and then took on the #9 seeded QUALITY to make the Greyt Eight round. With a trip to the Furry Four on the line, CH SUPER SPEED (#7 seed) provided little competition which left yet another high seed, #15 seed and likely “Cinderella” of the tournament, True TALENT, as the only greyhound between him and a date in the championship. True TALENT was also a kennel mate, which ensured trainer Melony Holdren was going to be guaranteed a spot in the championship race. Challenger for the title would be coming from a #9 seed in the Midwest Region, MRL FULL BOAT. The Darren Henry Kennel entry started his career a little less than a year prior at Orange Park in Jacksonville, Florida and immediately showed the signs of a soon to be distance runner. Slow at the break with a steady closing pace, this black male was moved to their 660 yard course in just his tenth career start. Once he moved over to that distance, he rattled off thirteen consecutive in the money finishes before being moved to Southland in September where he wasted no time in compiling six straight board hits on the Razorback Course (660 yards) as well. The only concern usually for these slow breaker, distance runner types in a stakes format like this is getting through the first two rounds of full fields, facing usually tough sprinters who are at “home” on the 583 yard course. Not only did MRL FULL BOAT get through the first two rounds, he likely caught everyone by surprise. Not only did he blow through his competition during the qualifying rounds by beating the greyhound he was matched up against, he was flat out winning the whole race outright! He went undefeated (6 for 6) and accomplished that in the same driving fashion he was known for on the longer course. None of those six races did he have the lead until the final turn/homestretch run so while the margins of victory may not have jarred memories of the great BELLA INFRARED, there was also little doubt on who was best in those races either. With a two dog match race, very little, if any trouble usually occurs, and if it does, it is usually at the start of the race when a rail runner may want the outside or vice versa. Even that appeared wasn’t going to be an issue either as each drew a favorable box to match their styles. CHEROKEE FIDDLE drew the three post which was just fine for his rail/inside style while MRL FULL BOAT drew the #6 which played perfectly for his midtrack running style. Two pretty decent distance greyhounds starting from a favored post going toe to toe for the championship. Everything looked good on paper. Now it just came down to the race. The likely winner would be the early leader, and things looked really good when the box opened for one CHEROKEE FIDDLE. The red male alertly broke on top and established a two length lead over rival MRL FULL BOAT for the first three quarters of the trip around the track. This was nothing new, or anything to be worried about for fans and backers of MRL FULL BOAT. He was used to being behind in the race until the far turn. In that far turn the gap slowly tightened up, giving hope that “Boat’s” undefeated streak still had a chance of continuing on. The lead went down to a length and a half, and then a length as the pair shot down the homestretch towards the finish line. As the pair went through the photo lights, it was proven that CHEROKEE FIDDLE had just enough left in the tank to hold on and take home a championship. And, although the ½ length official lead at the end of the race was a bit closer than kennel owner Randy Finegan would have liked for comfort, he knew the type of greyhound he was up against. The win was a first for a couple of reasons. It was not only CHEROKEE FIDDLE’s first stakes victory for his career, but it was also trainer Melony Holdren’s first careers stakes victory as a trainer too. For many years of Melony’s career in greyhound racing, she was based at Birmingham Race Course where stakes racing was pretty much non-existent during her training career down there. You could tell the win was very special, and it should be. Only one can be the champion, and in this case, the odds were figuratively 1 in 64. CHEROKEE FIDDLE is owned by Jacobs Racing and Rich Armington. A familiar face is leading a remaining field of 32 greyhounds vying for eight spots in the $25,000 River Course Classic at Southland Casino Racing. AMERICAN AIRDINE (Lester Raines Kennel) is sitting on top the qualifying points leaderboard with 40 after compiling two victories and a second place effort in the three qualifying rounds thus far. He is looking to try and get his second stakes championship after winning last year’s Marathon Division Championship in the Festival of Stakes. Currently in second place is ARKANS LEO (Darren Henry Kennel) who claimed a third place finish in the opening round and followed that up with two straight wins to tally 37 points thus far. The leaderboard tightens up quite a bit after that, however, as just five points separate third place in the standings from 10th position, making the semi-final round crucial for locking up the remaining six open spots in the finals. Notables that have some work to do include BGR MONSTER (Robert Thorne, LLC), recent winner of a first team All-American award and Flashy Sir award who popped off a big win in the opening round but has followed that up with two straight fifth place finishes. Sitting currently at 21 points (14th place), a victory would likely cement him a spot in the finals, while a second place finish would likely be a coin-flip at best to earn a bid. MORAL CODE, who won the consolation race in the Marathon Division last Fall, is currently in a three way tie for the eighth and final spot in the championship with 25 points if it ended today. Although there is a little more wiggle room in the semi’s for him, a finish worse than third will likely slide him down to the consolation bracket. The semi-final round of action in the River Course Classic is scheduled for Sunday with the championship and consolation races in the event taking place on Saturday afternoon, April 20th.